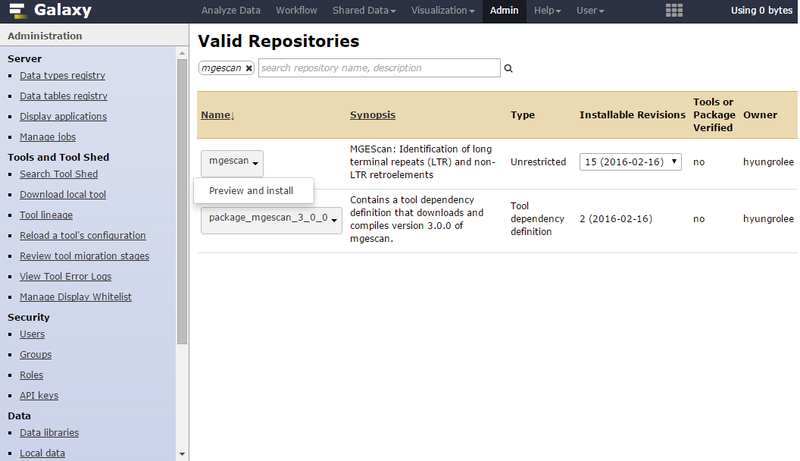 MGEScan is available in Galaxy ToolShed to install MGEScan tools and dependencies from the public Galaxy Tool Shed (https://toolshed.g2.bx.psu.edu). A few clicks allow you to install MGEScan and required software easily e.g. HMMER, Tandem Repeat Finder, and EMBOSS. The following installation guide explains how to apply MGEScan to your existing or brand new Galaxy server using ToolShed. You need to make sure the following system packages are available on your system prior to install MGEScan. 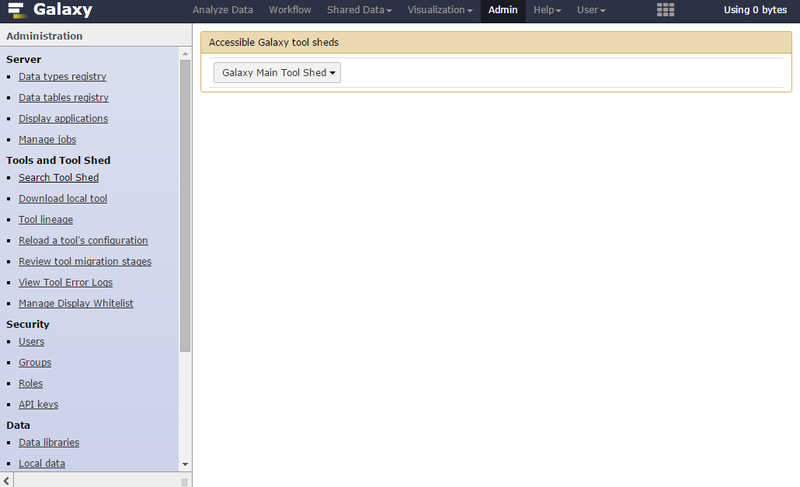 Admin user only is able to add a new Galaxy Tool from ToolShed. Find Admin link from the top menu tab. Click Search Tool Shed on the left menu tab of the Admin page. 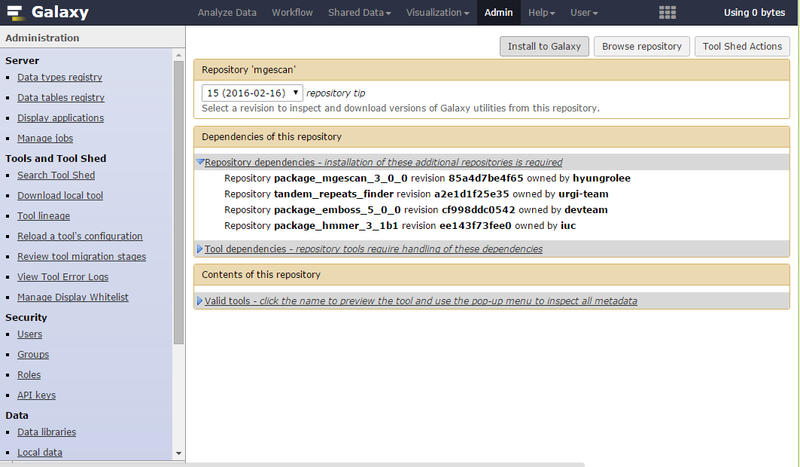 If you can find ‘Galaxy Main Tool Shed’ select button on the right page, click Browse valid repositories. It redirects the page to the public Galaxy toolshed page in which 3,728 tools available in 2016. Type mgescan in the search box. Choose mgescan, not package_mgescan_3_0_0 to preview and install. You may find there are other dependencies to be installed as well. 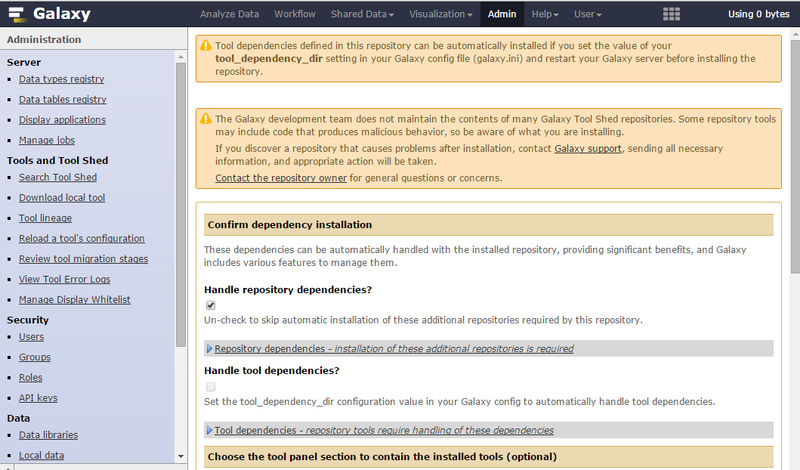 If you are ready to install, find Install to Galaxy button on top of the page. It goes to the confirmation page. 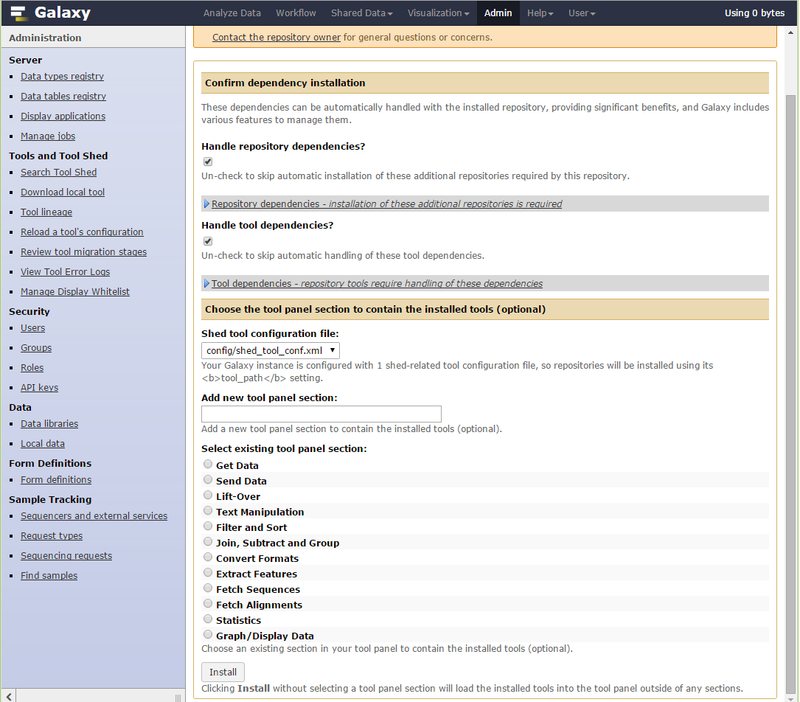 You need to make sure repository dependencies and tool dependencies are checked in the page. Otherwise, necessary tools or repositories may not be installed properly. You will find Install button at the bottom of the page. Once you click the button, your Galaxy server starts to download tools and repositories and install MGEScan on your Galaxy. You can find MGEScan from Manage installed tools page from the left menu tab in the admin page. 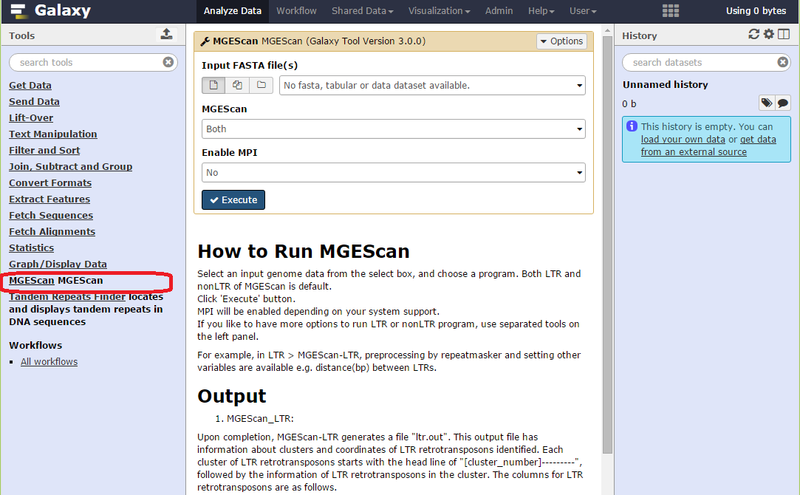 mgescan tool adds EMBSS, HMMER, Tandem Repeat Finder and MGEScan packages. You need to find all these tools are successfully installed. Installation Status indicates whether is is installed properly with colors. Installed with light green box indicates the tool or package installation is succeeded, if you see grey box, there is some issue in the installation. Go to the main page of your Galaxy. The new MGEScan MGEScan tool is available on your left tool menu tab. © Copyright 2014, Hyungro Lee. Revision 983e30b3.